Together, we can unlock potential in a developing community by providing clean, safe water. Hi! My name is Abby. During our homeschool unit study on water this year I found out how important water is to people and the earth. I also found out that some people in other countries don't have clean water to drink and it is making them sick. I want to help them. 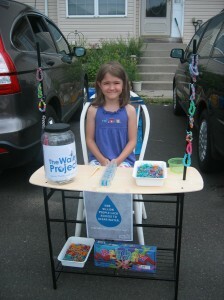 I am making homemade Rainbow Loom bracelets for $0.25 each to raise enough money to provide clean water for a family in a country where clean water is hard to find. Did you know nearly 1 billion people don't have safe water to drink? Together, we can change that. Let's fund a new source of drinking water for those who suffer needlessly without it! Our gifts will be used to construct or rehabilitate a water project, like a well or sand dam, in Africa. We'll see pictures, GPS coordinates, and updates as they come in from the actual water project we fund so we can celebrate the results along with the community we help. Will You Join Us in Giving Clean, Safe Water? 10/23/13 Fran Pearson $23.00 Abby what a great cause. So nice to see someone so young investing in their future. Good luck! 10/23/13 Kristina Petrea $11.00 Great job!!! 06/20/13 Diane Edson $23.00 You are an inspiration Abby! 06/20/13 Eric & Kimberly $10.00 Nice work, Abby! 06/20/13 Aaron Deming $23.00 Best of luck Abby! You are a true inspiration :) Thank you for helping to make the world a better place! 06/20/13 Megan Maryott $23.00 Good luck Abby!! The Water Project, Inc. is a 501(c)(3) non-profit organization unlocking human potential by providing clean, safe water to communities around the world who suffer needlessly without. Working with local partners in countries like Kenya, Rwanda, Sierra Leone, South Sudan, and Uganda, we build long lasting water projects that are organized, owned and managed by the communities receiving them. Together, with our partners we identify, implement, report on and follow up on every project. Then we share the whole story with you to inspire confidence in the work being done and the impact it has. You'll love these stories - from the field - in your inbox!